Strong: JPY, AUD, CHF. The preferred range is from 6 to 8. Average: USD, CAD, NZD. The preferred range is from 3 to 5. Weak: EUR, GBP. The preferred range is from 1 to 2. The charts were provided in the article: "Forex Currency Score Classification for Wk17". Besides these the "13 weeks Currency Classification" chart of each currency is also consulted and compared. These have been updated and can be found in the article: "Forex Currency Score Classification for Wk17". 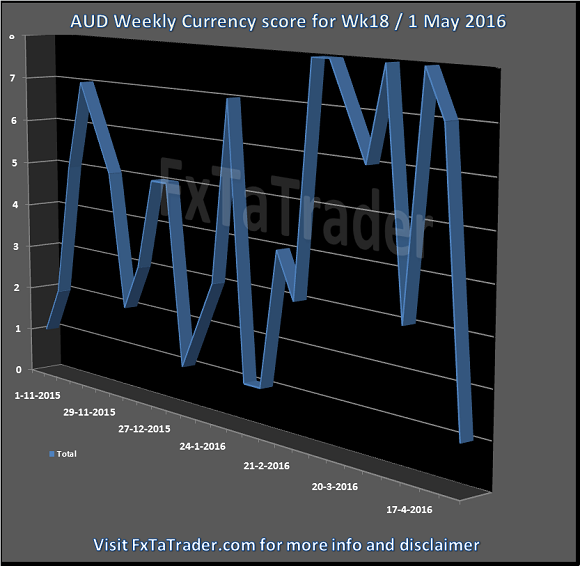 Last week the AUD took a dive and the score of 7 from the week before changed into a score of 1. Nevertheless, the currency remains strong over a longer period. See the chart below for more details. The comparison table provides a way to compare currencies from a longer term perspective of 13 weeks and also simultaneously taking the current trend into account. 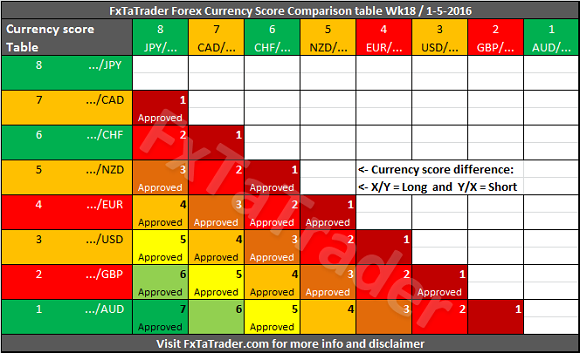 By coloring the currencies in the X and Y axis according to their Classification, see "Forex Currency Score Classification for Wk17", we can show what the best combinations are. In doing this we apply 2 rules to make it clear. Based on the last "3 months currency classification" and the "Currency Comparison Table" the most interesting currencies for going long seem to be the JPY, CAD and CHF. These are strong or average currencies from a longer term perspective when looking at the last "3 months currency classification". For going short the same analysis can be done and the USD, GBP and the AUD seem to fit best. These are weak or average currencies from a longer term perspective. A crossed join between the Top 10 pairs in the "Ranking and Rating List", the "Currency Comparison Table" and the pairs with the best charts mentioned here above shows the following interesting pairs: GBP/JPY, AUD/JPY, USD/JPY. The following pair is not mentioned in the Top 10 of the Ranking and Rating list: CHF/JPY. From these pairs only the GBP/JPY and the AUD/JPY seem to be interesting according to the combinations mentioned in the crossed join here above. However, if we compare these pairs only with the "Currency Comparison Table" they are all approved. 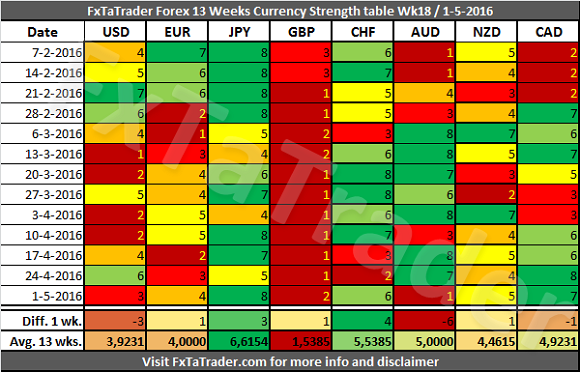 The Forex "13 Weeks Currency Strength" and the "Comparison Table" provide meaningful data for my FxTaTrader strategy. Besides this I also use the "Forex Ranking, Rating and Score" which is also available once a week on my blog at FxTaTrader.com. If you would like to use this article then mention the source by providing the URL FxTaTrader.com or the direct link to this article. Good luck in the coming week.